on Monday, June 04, 2012. Gold's review of the long-awaited GX-61 Daioja Soul of Chogokin figure is up. WOOHOO!! on Saturday, June 02, 2012. Vinyl Robot- Denjin Zaboga by Bullmark. Months have elapsed since I purchased a robot. Who would have guessed that a local antique shop had this?! on Sunday, May 20, 2012. In all that alloy sexiness! Robot Toy Reviews- Gold has been BUSY!! on Saturday, May 19, 2012. Gold has done a ton of robot toy reviews in the past month. Catch up on all the latest, from SRC to CMs to Masterpiece Transformers! on Saturday, May 05, 2012. Coming soon from Evolution Toys! Coming soon--Dynamite Action Number 4, Atranger Robot! on Thursday, April 26, 2012. 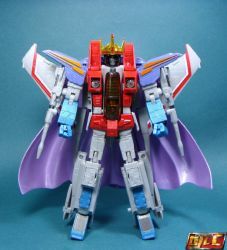 Discriminating Acroyears travel on crawling translucent skulls or what I made out of a trashed Takara Webdiver Gradion. This toyhack is one of the most technically insane I've done thus far. That it holds together is a small miracle as it is made up of many unrelated pieces and like all my other hacks uses no screws just 5mm pegs. I started it back last year and put it down. I recently picked it up again and was determined to resolve it. on Thursday, April 12, 2012. Microtron is an iconic Micronauts figure. The assignment was to wrestle something new from something so recognizable. The big question really was: what am I going to do with his curiously placed drill? on Saturday, April 07, 2012. Comic Series #2 is here for Armarauders. Enjoy! on Thursday, March 29, 2012. Here is some fresh robot candy for the eye. In typical Japanese robot fashon, somehow even the least expensive toys manage to capture the soul. Bring us your beat up, bring us your downtrodden, we will capture you on photos.